Pattaya United cast aside the club’s recent run of poor results with a resounding 3-0 victory over Sukhothai FC at the Nongprue Stadium last weekend. The Saturday, May 5, League One fixture saw United come out of the blocks strongly and display little of the jittery defending that has been a feature of their recent performances. Sukhothai, sitting in the upper half of the league table, gradually found their rhythm and began to press United onto the back foot but they fell behind on the half hour mark when Dolphins’ midfielder Phumin Kaewta was first to react to a smart cross from Lukian and he turned the ball into the visitors’ net from close range. 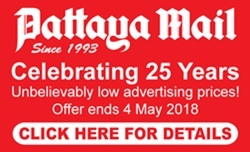 Sukhothai had a chance to draw level soon after conceding but Madagascan forward Rakotoharimalala volleyed the ball over the Pattaya bar when well placed. The miss was almost immediately costly as United’s Chayawat Srinawong headed the ball against the visitors’ crossbar with goalkeeper Eiam-mak well beaten. Coming out after the break with a 1-0 lead, United began to slowly exert their dominance on the game and came close on several occasions to doubling their advantage. Kaewta headed the ball against the Sukhothai woodwork with the goal at his mercy and then United’s Brazilian playmaker Rafinha sent his compatriot Lukian through on goal, only for the latter to see his fierce shot crash off the crossbar and out to safety. The hosts finally achieved some breathing space in the 64th minute when Korean fullback Lee Won-Young came up for a corner kick and after finding space at the edge of the Sukhothai area he connected sweetly with a right-foot volley that flew past Eiam-mak into the goal. United’s club captain was also heavily involved in his side’s third goal 12 minutes later when Eiam-mak rushed off his line to claim the ball from a Dolphins’ free kick only to find himself in no-man’s land and Won-Young, lurking at the far post, had the simple task of heading the ball into an empty goal to double his own personal tally. The visitors had a brief period of late pressure but they were unable to pierce the resolute United defence, which for once was able to record a clean sheet. Pattaya United have now moved up to twelfth place in the league standings on 20 points from 14 games played. The Dolphins’ next fixture comes on Saturday, May 12 with an away match at Ratchaburi FC. Kick-off is scheduled for 6pm.